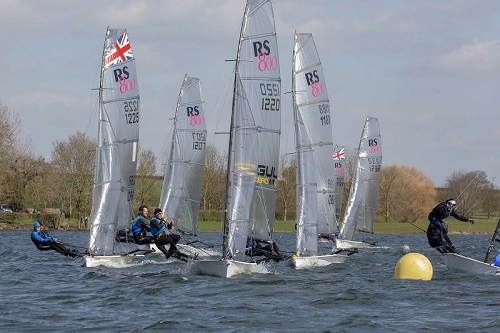 The RS800 Spring Open saw a weekend of high adrenaline thrills and spills, palpable suspense and brain teasing conditions that wreaked havoc both on the water and in any attempt to get your hands on some food from the canteen. The chicken burger induced scuffles, queuing anarchy and complete breakdown of society caused by a lack of coleslaw left a few wishing they’d packed a few more Babybels for the trip up North. Whilst the Spring champs are invariably a chilly affair they represent a time of renewed hope that the sun will one day be seen again and soon we will all be drinking rum on sun drenched balconies talking about hot and puffy sea breezes. That first neoprene wrestle back into the dreaded steamer that has a faint whiff of long decomposed goose poo is really a time of joy marking a shift in fortunes and a long Summer of sun cream application to look forward to. For this episode of organic smelling wetsuit wrestling a dozen rS800s made the journey North. Most of the pre-race banter centred on just how long it had been since they were last afloat as everyone made well sure they got their excuses in early. Despite alibis being thrown about as liberally as innuendos during bun week on Bake Off it actually turned out to be a hugely competitive weekend of immensely close racing. 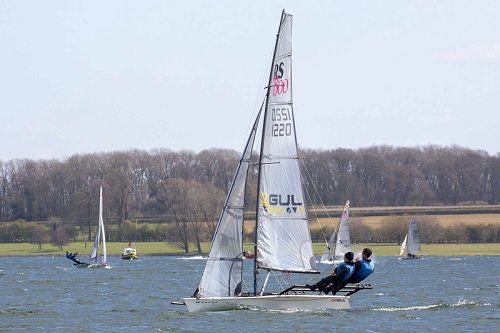 It turns out that months of not sailing is an excellent leveller! Saturday’s forecast didn’t look the rosiest but the fleet had clearly forgotten what it was like to sail in five knots and so eagerly headed out to the start line. 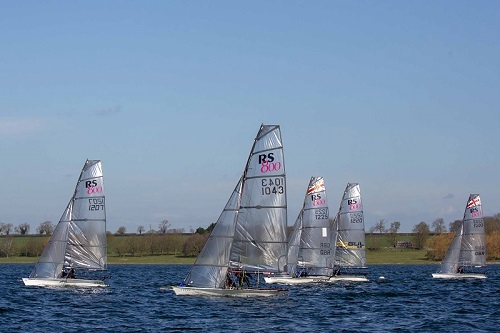 RS800s were first out of the gate and despite sharing the race course with a number of skiff classes and some Laser 4000s we were relatively untroubled thanks to the application of an inner/outer loop scenario with multiple windward marks by the super organised race team. Also it turns out that if you just shout “Hello” at any oncoming Musto Skiffs they sometimes just fall over. Very polite. 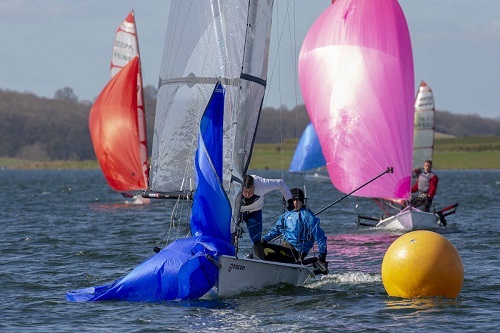 No one seemed that dominant on Saturday and this was reflected in the results with the McEwens, Tim Gratton and Fiona Hampshire and the Singletons all snatching races. It was really a case of keeping your eyes out of the boat and hoping that your little puff would out-puff any other puffs to achieve a puffect race. Other considerations were whether to stick with the bunches or go a-corner-whacking - the old pack or whack dilemma. Dan and Debbie demonstrated the pros and cons of the latter to great effect a couple of times! The wind which had already switched off a couple of times in race three finally ran out of blow as we slipped through the finish line. A quick scan of the results on Saturday night showed that things were looking tight with a handful of boats all impressing. Most did the sensible thing and had a pint. Fiona went for a 10km jog. In terms of Rutland accommodation I can highly recommend a lovely airbnb room nearby. On entering the abode Hannah and I were promptly informed that this was actually Chris Packham’s favourite room in Rutland. Quite the accolade but it did raise a number of questions. How many rooms in Rutland has Chris Packham tried? Why Rutland? And for Hannah, who the hell is Chris Packham?? Anyway, my review…very pleasant but I must add that the bed was a little short. Makes you wonder really…how tall is Chris Packham? Sunday was as shifty as Saturday but with an added 10-15 knots of wind to mix things up a bit. As you can imagine this caused some spicy lay line action. In fact lay lines didn’t really seem relevant until you were within touching distance of the mark. In the building wind John Mather and Phil Walker even got clean blown over at one point - clearly highlighting a complete misunderstanding of the off season festive diet. As a top tip I generally like to work my way through half a dozen tubs of celebrations to make sure silly and avoidable things like that don’t happen in the Spring. Please see Brian Butterfield’s Christmas pizza recipe/YouTube video for further coaching. Gluttony for gold. As it transpires though, and as I found out to my detriment, festive gluttony does not stop the prospect of falling out the back of the boat. Other dramas included a literal armada of kayaks clearly looking for trouble in race one. However, one charge by Tim/Fiona soon saw them scatter. ANYWAY. Sunday saw plenty more tight racing and although the McEwens did put their stamp on Sunday’s proceedings there were scuffles and skirmishes all over the race course. Behind the McEwens’ consistent bulleting there was a real Battle Royale for the podium forming. In the end it was the Singletons who snatched second ahead of Hugh Shone/Hannah Tattersall with Tim/Fiona, Phil/John and the Cockerills seeing out a very compact top six. Dry bags were kindly sponsored by Rooster and trophies were handed out - the trophies although attractive had a particularly weapon-like look about them and would not be out of place on a Midsummer Murders set. A massive thank you is in order to all the club’s teams that made this event so fantastic, Rooster for their sponsorship of the Tour and to all the competitors who came up and did battle. Really great to see everyone and looking forward to a great year. Stokes Bay is next up 13-14 April - see you there! !